Love chocolate? Want to run your own business? Live the dream with Leoni’s Children’s Chocolate Parties! If you love chocolate and want to run your own business, now could be the perfect time to unwrap the secret of a dream job! It’s a unique business opportunity for talented, fun-loving and motivated people to share in the chocolate firm’s sweet taste of success. 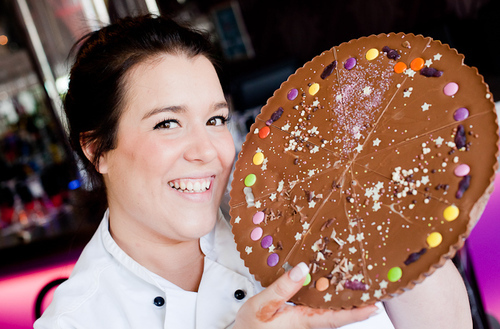 Leoni’s Children’s Chocolate Parties are the creation of Leoni Wilton, daughter of Bournemouth based chocolate entrepreneur Gerry Wilton, founder of chocolate events company Chocolate Delight. Choco-preneur Gerry set up a thriving business providing chocolate fountains for weddings, parties and film premieres before founding The Chocolate Boutique Hotel, recently named one of the six top novelty hotels in the world by the Sunday Times Travel Magazine. Growing up in the family’s chocolate empire, Leoni soon developed a taste for the business and proved she was a chip off the old block by launching her own children’s chocolate party venture. Now Chocolate Delight is looking for people passionate about chocolate to join in their success. “We initially trialled the Leoni’s Children’s Chocolate Parties concept in Dorset,” said Gerry Wilton, who also runs chocolate themed team building events nationwide for firms such as Walt Disney, Tesco and Marks & Spencer. “It went down a storm and we soon found ourselves inundated with requests from people all across the country who wanted us to organise children’s chocolate parties for them. “As a result, we have licensed the Leoni’s Children’s Chocolate Parties concept to enable like-minded people to share in our success. Founded in 2004 by the Wilton family, Chocolate Delight was one of the first companies to have a commercial chocolate fountain in the UK and quickly established itself as the leading chocolate fountain hire company. It was soon called on by corporates, event companies and celebrities to provide fountains for functions such as film premieres and weddings, including Peter and Jordan’s. In 2006, the Wilton family saw the opportunity to expand and bought a beautiful but outdated 19th century grade II listed hotel. Christmas 2007 saw the renovation of the building and it became The Chocolate Boutique Hotel, the world’s first chocolate themed hotel. Today, Chocolate Delight is one of the most successful UK chocolate companies in its field and holds Chocolate Workshops across the country. Its Corporate Chocolate Teambuilding events commenced late in 2005 and are now run all over the UK and more recently in Europe. Last year saw Chocolate Delight in Spain, France, Austria and Switzerland. This press release was distributed by ResponseSource Press Release Wire on behalf of TWPR in the following categories: Business & Finance, for more information visit https://pressreleasewire.responsesource.com/about.